At EDMay our mission is to supply the finest, purest, natural products at honest, competitive prices worldwide. Our products include essential oil, fragrance & aromatic body oils as well as personal health and beauty products. Customer service is a high priority for us. Shop and enjoy! 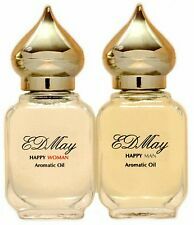 EDMay HAPPY MAN African Musk Premium Aromatic Body Oil Cologne Masculine 10 ml.